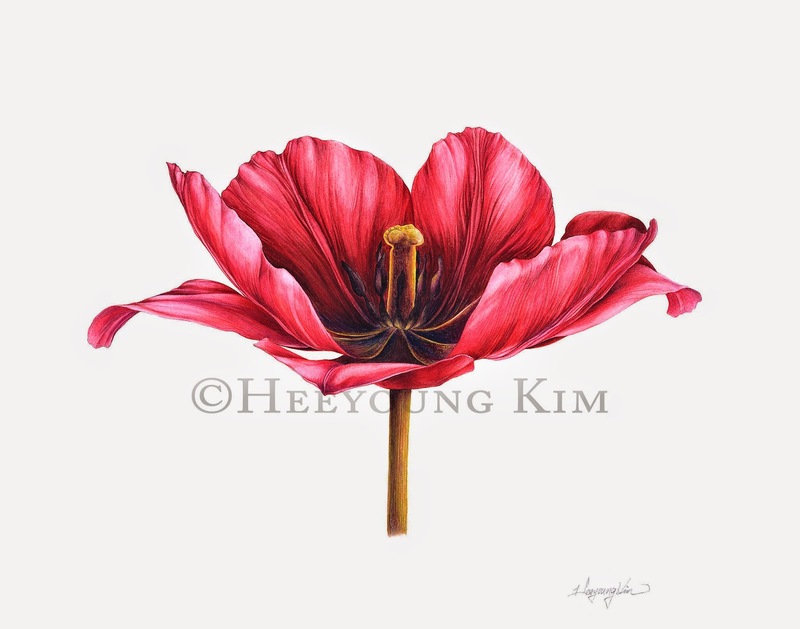 I painted this in the first year when I studied botanical art. And this one taught me a very valuable lesson. At that time, I had no idea about botany, or what facts need to be shown in botanical paintings. I bought a pot of tulips from Sunset Foods, local grocery store, just because the color was gorgeous. I waited until they fully bloomed because I wanted to show the inside of the flowers. After some diligent work, this painting was finished. Then I figured out it needed to be identified. The tag in the pot didn't show scientific name. I contacted the store, and its provider, and even the grower. The answer was unbelievable: nobody had record of this tulip. They said as soon as a better looking hybrid is created, the older ones most likely disappear. That was quite a surprising discovery to me: a fate of a hybrid. On top of that, this particular one had seven petals, on the contrary to six in normal tulips. Another good lesson! A muted one I painted!